The retail industry is enduring a uniquely tumultuous period. It’s not that consumers aren’t spending money. In fact, customers are spending money on retail items at increasingly higher levels, even to the detriment of their savings accounts. However, the ways that they are spending money is changing. Primarily, this means that consumer spending is becoming more digital. According to the U.S. Census Bureau, online sales are at their highest levels ever. While e-commerce behemoth, Amazon, receives most of the attention, it’s actually difficult to identify a major retailer that doesn’t have a robust digital strategy as a roadmap for their operations. This vast reorganization and reprioritization means that companies have to fight for the right to stay in business. Not everyone is so adept at this change. As Toys R Us, the once unflappable toy retailer, finally succumbs to its long, drawn-out death, the writing on the wall is clear. Change or be rearranged. Of course, that concept is nothing new. The Darwinian notion that the strongest survive while the weakness dies off is a paramount pillar of the capitalistic ethos. What’s more, this trend has been happening for a long time. When the traditional models are not good enough anymore, and companies are finding creative ways to access the collection of customers ready to spend money. In a 2013 article, The Harvard Business Review found that companies were quickly moving away from a system of static loyalty cards into a more dynamic system of reward and interaction. The report concludes that this practice is more akin to a corporate currency than a discount card, and it’s a great way to keep people connected to a platform. Corporate gift cards are the primary expression of these efforts. According to Harvard’s report, corporate currencies had $110 billion in buying power in 2013, and that number has only increased as mobile technology has made it easier for companies to develop creative ways to engage with their customers. As consumers become more tech-savvy and digital in their approach, there is an opportunity for businesses to tap into the rising popularity of cryptocurrencies, especially among millennials and younger generations of shoppers. Although they are nearly a decade old, cryptocurrencies truly came into vogue in the past 18 months, and a lot of people own them. According to CoinMarketCap, the collective cap for digital currencies is near $250 billion, and at times, this number has exceeded $800 billion. While these digital currencies are exciting and valuable, many people don’t have a way to actually use their currencies. It can be difficult to convert crypto assets to fiat money, so investors often can’t use their digital currencies to go shopping. In other words, there are a lot of people with digital currency and a narrow outlet for using it. Strategic retailers can tap into this potential to best cater to younger generations and their spending habits. For example, several blockchain-based platforms allow customers to purchase gift cards with cryptocurrencies. One of those most comprehensive platforms, Zeex, allows cryptocurrency holders to use a variety of digital currencies to purchase gift cards from a network of more than 350 major retailers. Zeex is an offshoot of Zeek Group, a platform that allows users to buy and sell gift cards to different retailers. Therefore, they are well-versed in the gift card market. This also solves the issue of spending cryptocurrencies, due to their infamous volatility rates and regulatory nightmares. In addition, companies like eGifter or GiftToken allow users to purchase gift cards using Bitcoin, the first and most popular cryptocurrency. 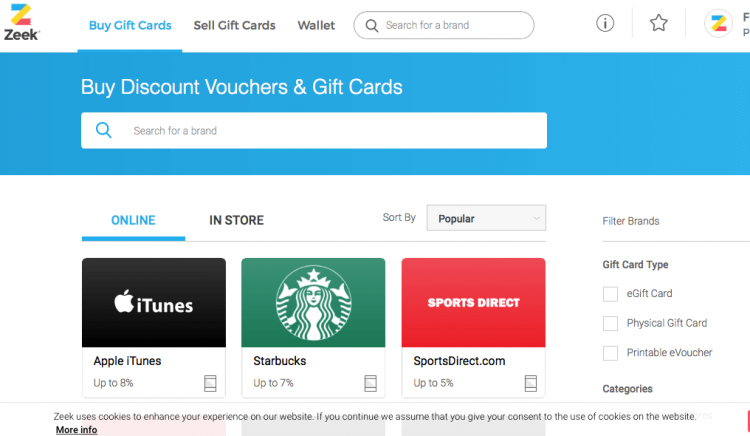 Although these platforms are more limited because they only allow Bitcoin holders to buy gift cards, they are places where retail outlets should be partnering. As the retail landscape becomes increasingly digital, companies are being forced to reorient their business practices. Since one of the most effective methods for attaining and retaining customer loyalty is through corporate currency in the form of gift cards, there are steps that companies can take to ensure that they are on the front lines of these endeavors. Nobody wants to be left behind, and as cryptocurrencies are increasingly becoming a part of the mainstream financial landscape, it’s essential for retailers to find ways to allow holders to spend their money. By partnering with companies like Zeex, eGifter, or GiftToken, companies can tap into that market while simultaneously enhancing customer loyalty through their corporate currency. It’s a win-win. Don’t miss it.